Opa! This celebratory Greek phrase will be heard ringing across the courtyards of the church in May. 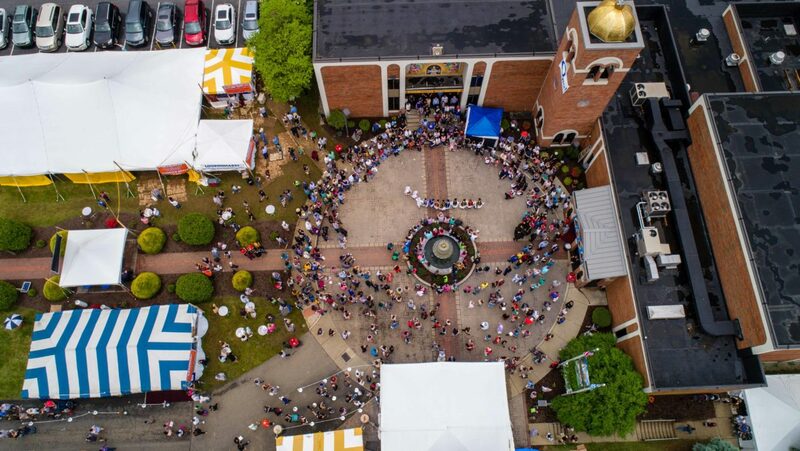 Now in its 47th year, the church members are in full swing preparing for the annual Greek Festival. 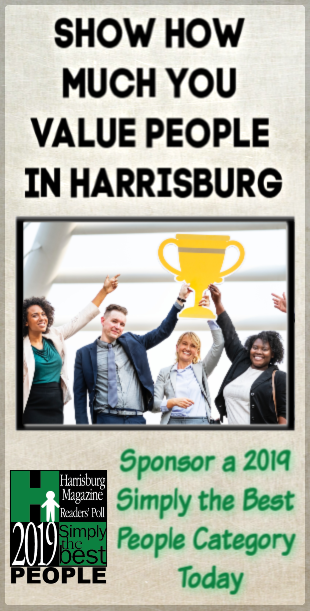 For almost half a century, the church has been participating in small festivals and bazaars in the Harrisburg area. Mallios, recalls being on Walnut Street, selling only a few food items that different restaurants would make. Now, equipped with multiple large walk in freezers and twelve confection ovens, the church hosts and prepares everything on its own property with a full team working hard. Besides their wide variety of pastries, members also serve up four delicious meals: lamb shank, moussaka, pastitsio, and Athenian chicken. For the past several years, they have also made moussaka and pastitsio available as frozen meals to take home so you can make yourself an authentic Greek meal. 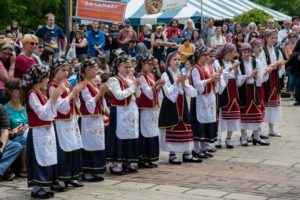 According to Mallios, the festival sells 2,000 lamb dinners, 1,200 chicken dinners, 2,700 moussaka dinners, and 2,200 pastitsio dinners. The frozen take-home dinners can be bought for $22 and easily feed around four to five people. They’ve made 750 of both moussaka and pastitsio. And of course, you can’t have a Greek festival without offering gyros and souvlaki. These traditional foods are some of the festival’s most popular, and are served right in the courtyard. 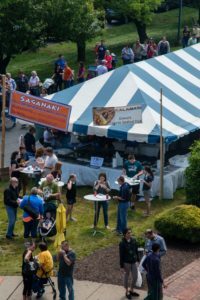 Now, eating amazing food isn’t the only activity that takes place during one of PA’s biggest cultural festivals. 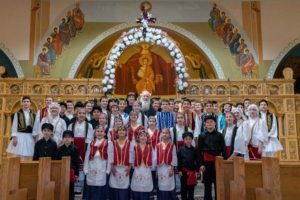 There are also dance performances and even a church tour and presentation given by Father Michael Varvarelis. 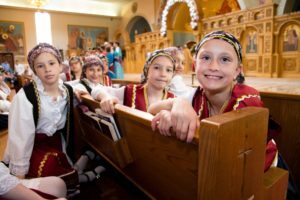 “There are about 80 kids in the dance group, the Olympic Flame Dancers, who are split into three different teams. Every two hours one of the groups performs. They start Friday, go all day Saturday, and on Sunday they do one big feature where all of the dancers come out,” Zozos explains. Every year, the festival also tries to feature a new or different product. This year, a boutique olive oil will be featured. The company, Argoladi, offers a premium extra virgin olive oil produced by the Vlachopoulos family in Kranidi, Greece. It is then imported and distributed in the USA by Floros-Phelps, LLC. The olive oil, which is cold pressed from the early harvested green olives, has noticable health benefits and has even won several awards. “The early harvest of green olives, is very important because although the yield of the oil is less, the quality of the oil is much better than what you get with ripe olives. Less quantity but higher quality,” says David Phelps, one of the distributors. “The oil is pressed within 24 to 48 hours. The batch we will be selling was pressed in November 2017 and has very high levels of polyphenols, or antioxidants, which allows us to legally claim health benefits, specifically protection of the lipids from oxidative stress,” explains Joanna Floros, the other half of the distributing team. Why are the health benefits so emphasized by the Floros-Phelps, LLC team? It might have to do with both of their backgrounds as doctors through Hershey Medical Center. Their connection with the family through knowing them from Greece led to a realization of the shared passion both families had for creating healthy, organic oil. 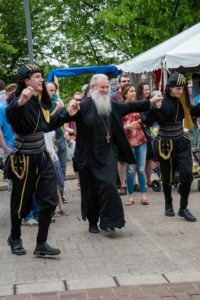 For more information on the food menu, a map and vendors that will be at the upcoming Greek Festival, check out their website, www.PAGreekFest.com or find them on Facebook. Preheat oven to 350º F Beat the eggs, add sugar, then slowly pour melted butter in while whisking. After all wet ingredients are mixed well; Add baking powder. 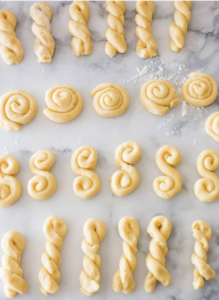 Slowly add flour to the outsides of your bowl while making small circles with your whisk. Dough will start to tighten up and get more firm…keep adding! When it is not possible to use the whisk anymore it’s time to use your hands. While continuing to add flour to the edges of the bowl, keep working in flour in a kneading motion. Do this until dough is firm enough to roll out into strands about the thickness of your pinky finger (flour for rolling optional). After you have formed your cookies place them on a pan and use a pastry brush to coat them with the egg (egg wash). Cook until golden brown, approx. 10-12 minutes.